Derrick Rose Tuesday in his first official NBA game in 18 months since reconstructive knee surgery shot four of 15 with one of seven on threes, added four assists but five turnovers in a 107-95 loss to the Miami Heat in which the Bulls trailed by 25 points in the fourth quarter. “If anything I’m disappointed in the loss,” said Rose, who flew most of his family to the game, including his young son and rented out several suites in the American Airlines Arena. “My performance, I can easily change that by making shots and turning down the turnovers,” Rose continued. “It’s something we can learn from. It’s not the end of the world; it’s not the playoffs where we’re going to be eliminated. We can fix things. A learning experience. Tonight we did not show what we were capable of. Rose will. There seems no doubt his knee is sound, and he even seemed surprised when a reporter asked about it following the game. But this was a little like the Y2K night in 1999 when the world was supposed to come to an end. Certainly, the Maya never would have predicted this. That’s all? That’s it? We waited more than a year for that game? All that talk about this game and that performance? Though Rose showed in an 8-0 preseason averaging more than 20 points per game that he and his knee were healthy, this was what everyone has been anticipating for more than a year. Especially Rose. And even better the way the theatrical NBA set it up against the rival Miami Heat on ring night. Conference finals preview? MVP candidate faceoff? Changing of the guards? The State of the Bulls for this night, however, was not strong. Bulls nation was in recession. Because the Heat, in a balanced game with seven players in double figures led by LeBron James with 17 points, trapped and pressured Rose on every possession. The Bulls failed to respond appropriately and offered up 13 turnovers in the first half, missed nine of 11 threes by halftime, saw their famed defense blitzed for 37 second quarter points, gave up easy penetration and stood around as the Heat seemed to toy with them in taking a 54-33 halftime lead. Actually, there were some excuses. Both Luol Deng and Jimmy Butler, the latter with a strong second half that gave him 20 points for the game, were both in early foul trouble. Deng got a third late in the first quarter and had to sit out the entire second quarter when the game caved in on the Bulls. Butler picked up a third early in the second quarter, and Miami then carved up the Bulls as the Bulls had to go with big guys, who had trouble getting out to Miami’s shooters, and slow guys, who just had trouble. The Heat went on to hit five threes in the quarter to break the game open as the Bulls shooting was brutally poor. Those were the guys you wanted for your firing squad. Coach Tom Thibodeau declined to discuss the officiating. But Deng said it did have an effect, though the Bulls could have dealt with it better. “I don’t think we got the best whistle throughout the whole game,” said Deng, who never got going and finished with four points and was zero for five on threes. “I thought two of my four fouls were not fouls at all. The refs even said that when I asked them. But it happens sometimes. Today, it just didn’t go our way. I don’t want to say anything negative or bad about the refs. They’re trying to do a good job out there. I don’t think they’re favoring one side. They’re humans and I felt tonight they missed some calls on us. Carlos Boozer had one of his best games as a Bull with 31 points and seven rebounds in just over 32 minutes, constantly powering inside and past the Heat defenders. Carlos Boozer had one of his best games as a Bull with 31 points and seven rebounds in just over 32 minutes, constantly powering inside and past the Heat defenders. Butler had that 17-point second half and Mike Dunleavy added 10 points in the second half after a brutal first half. Kirk Hinrich after sitting out the last week of games with a concussion fouled out in 29 rugged minutes. 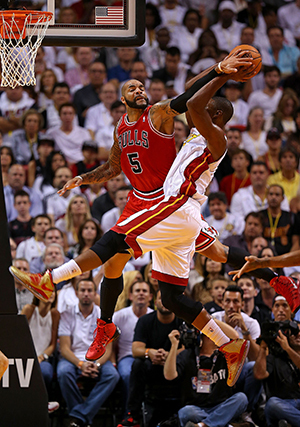 And Taj Gibson was solid with 10 points and eight rebounds and three assists. But ball movement was a problem as the Bulls seemed shocked by Miami’s tactics, though Rose often saw them before being injured and the Heat always traps the pick and rolls in their defense. The Bulls simply had a brain lock in failing to move the ball quickly and then swing to the other side as Rose was high with four assists. But if the Bulls offense was sloppy, the defense was uncertain. You know, the offense was poor, but the defense was bad. They did look good in their new pregame sweats, though. The Bulls defense relies, obviously, on helping as they push the screens to the baseline and sagging into the lane. But Miami did a wonderful job of moving the ball, beating defenders off the dribble and then pitching out to shooters. Rose had difficulties containing both Mario Chalmers and Norris Cole, though his help was often lax when he forced the dribbler baseline. And he got in trouble with his jump passes as Heat defenders anticipated well. Too often Bulls defenders raced out to cover the three point line, only to have the Heat player fake and get inside, breaking down the defense constantly. Even Ray Allen in slow motion garnered seven assists in driving and pitching out. But this was a game more that the Heat grabbed a hold of and the Bulls were sliding down a greased pole. Though the Bulls actually led early 9-2 as Rose scored the team’s first basket with a full length drive and another to go up seven shortly afterward, this was a somewhat untypical Bulls effort against Miami. The Bulls tend to be frothing, but in a good way, in these Miami games. But it seemed to be a tired Bulls team without the energy you’d normally expect not only from a debut game but one against the supposedly hated Heat. There were no technicals or really hard fouls, not that anyone is preaching violence. But that spirit you often see with the Bulls in these sorts of games wasn’t there. The obvious excuse was perhaps the late start as the Bulls remained in their locker room as the Heat players received their championship rings from NBA commissioner David Stern in his last such ceremony as he’s retiring later this season. But it was the Bulls who looked remorseful. The Bulls, nevertheless, held onto the lead most of the first quarter with Boozer barreling inside and Noah snatching five rebounds. The Heat nosed ahead late to finish the first quarter leading 17-15. But it seemed like one of those Bulls/Heat games James talked about before the game in discussing the Bulls. But that Bulls team left early. Certainly, the foul trouble made a difference, and Thibodeau gambled leaving Deng and then Butler in with two fouls, though Thibodeau clearly was worried about letting the game slip and also knowing Deng doesn’t get called for fouls often. By the time he got them back in after halftime, it was another ugly Florida sinkhole. Actually, it was not a depressed Bulls locker room. Sometimes being beaten so badly does that. But it’s also the first game and that one of 82 thing got a good workout in post game comments. It is a professional group and they did cut it to eight with 2:46 left on a Boozer drive, though you just never had the feeling the Bulls had it in them for a big move or surprise in this game. Though it made for a long night the way the Heat blew out in the second quarter with a 17-0 run. Rookie Tony Snell was rushed in with Dunleavy struggling on defense early and then Deng and Butler out. And suddenly he’s defending James, who was pushing him into any position he wanted. Snell hung in well, but James in your first NBA game trying to fight back from 20 down is not ideal. “A learning experience,” said Snell, “and trying to do the things Jimmy and Lu do.” Other than the fouls. Boozer continued to pound the rock in keeping the Bulls in the same zip code late in the second quarter as the Bulls seemed fortunate to be down just 21 at halftime. They recovered some in the third quarter with Deng and Butler back, though more trading baskets. Being too careful with fouls? Perhaps. But the urgency seemed lacking as Chalmers and Cole made things uncomfortable for a growing frustrated Rose, who would gather his teammates in a huddle near center court when it was over for some encouragement about looking forward and not back. Rose doesn’t admit such things, but his expression throughout the game suggested a player who really wanted this, perhaps going too hard at times. The usually indifferent Miami fan home gathering, many of whom were off early again to the beach parties like in the early departures last June from the Game 6 Finals comeback, got a scare again as Dunleavy finally found the range and Butler busted inside and began getting to the line and in the passing lanes with five steals. But eight points would be the closest as Shane Battier with four of four threes and Dwyane Wade with 13 points added threes to close a very untypical and not particularly dramatic Bulls/Heat game. Sometimes, as these things can go, the buildup and anticipation much exceeded the reality. So these Bulls aren’t quite ready for Miami yet. But Rose does seem healthy, which was the goal of the early part of the season after he missed all of last season. The things the Bulls know they can do better, like ball movement and tighter defense, can be remedied. Noah clearly was out of sorts with all the time off and Deng was distracted by the fouls. It wasn’t a game for Nazr Mohammed the way Miami plays small with all the shooters. 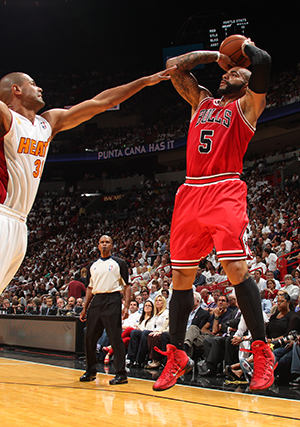 The Bulls know they need to outrebound Miami by double figures, and it was just 41-40. They don’t win those games. 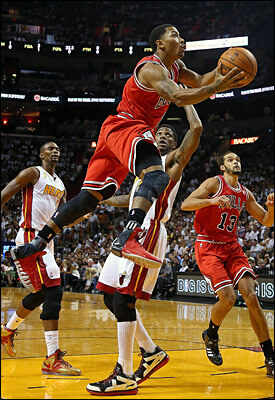 And so the Bulls move on to host New York Thursday in yet another Rose first, his initial home game with new ligaments. But the Bulls also come home with a lesson of sorts, which isn’t all bad even as they’re now tied for last in the Eastern Conference. Perhaps they’re not as good as advertised and a bit more work will get them there. Even one loss. As Thibodeau likes to say, the games will tell you what you need to do. But, hey, the 1991 champion Bulls began the season 0-3.